The summer holidays are nearly upon us and young readers will be looking for books to read in their Summer Reading Challenge or to pack in their suitcases. Short story anthologies are perfect reading material for the holidays because they can be read in short bursts, between fun activities and outings, or just to chill out, and the he perfect summer anthology for middle readers has just been published: Holiday Ha Ha Ha! (Simon & Schuster). 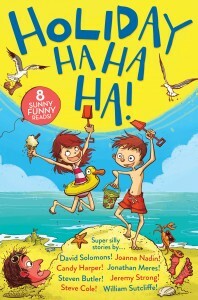 It comprises eight silly and funny stories from a selection of British children’s and teen authors. Funny books often get a bad press (controversial comment: *usually* from teachers) but there has been a huge push to give them the status they rightfully deserve (check out the Lollies Book Awards and This Book is Funny). Holiday Ha Ha Ha! includes stories from amazing aliens and strange superheroes to fantastic forests and crazy creatures; from ghoulish ghost tours and tiresome traffic jams to super spies and terrible talent shows; Lots of silliness, lots of laugh, and the joyous instant gratification of a good funny read, and with those bitesize stories, readers can easily read them again and again! I must also mention the fabulous cover by Jamie Littler, which really sets the tone of the anthology perfectly. I am delighted to be taking part in the Holiday Ha Ha Ha blog tour and to welcome Joanna Nadin, author of the hilarious Penny Dreadful series as well as some fabulous teenage fiction, to Library Mice for this installment. Her short story, Orlando’s Doom is a hilarious extract from Orlando Butterworth’s diary of her holiday in Wales. It was my little brother’s fault. Most things back then were my little brother’s fault, at least in my mind. And even if they weren’t, I’d blame him anyway. The time he was sick on my Noggin the Nog book. The time he sprayed his asthma inhaler on my ice cream so that I would have to give it to him. The time he claimed to have been to Egypt with his toy rabbit and no one seemed to pay heed to my insistence that he must be lying. The list of his transgressions was long, complicated and came with subsections to do with my continuing irritation at his getting his own way just for being the smallest. So loud and petty was our arguing, particularly during the summer holidays, that a wall of cushions had to be erected in the back seat of my dad’s car to keep us apart for the eight-hour drive to our grandparents’ house in Cornwall. This time, the argument was at the outdoor swimming pool at my grandfather’s golf club – a cracked, concrete affair, with cold and smelly showers and an ever-changing array of half-hearted lifeguards, but to us Essex children still a luxury beyond our wildest dreams. I don’t even recall what was at stake – maybe he had spilled or spit in my fizzy drink, maybe he had got the best armbands, maybe he had thrown my armbands into the middle of the pool where they might be stolen by Bigger Boys – but whatever it was, I was cross. Super cross. So cross in fact that I stormed around the pool to where my parents were trying to read the papers, and let stream a volley of invective about the idiocy of my sibling, demanding to know why they had had him in the first place, and could they possibly send him back there. It wasn’t until I was standing there, hands on hips in the hot 1970s sun awaiting a promise to get rid of the pest, that I realised the mother and father staring back at me in mild surprise weren’t actually mine. I suppose I should be grateful that they found it funny. So much so that they became friends of the family and met up year on year at the same spot. In fact everyone found it funny, especially my little brother, who retold the story to anyone who would listen and some who wouldn’t. 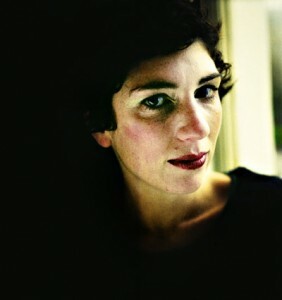 Joanna Nadin grew up in Saffron Walden in Essex. She has worked as a lifeguard, a radio newsreader, a producer on a cookery show, a journalist and a special advisor to the Prime Minister. She is the author of many children’s and YA books, including the Rachel Riley series. Holiday Ha Ha Ha! is out now!